Comes with the debugger engine. 디버거 엔진이 함께 제공됩니다. Covers core debugger operations like breakpoint, read - write from to memory and registers. 중단 점, 메모리와 레지스터에서 읽기 - 쓰기와 같은 핵심 디버거 작업을 포함합니다. 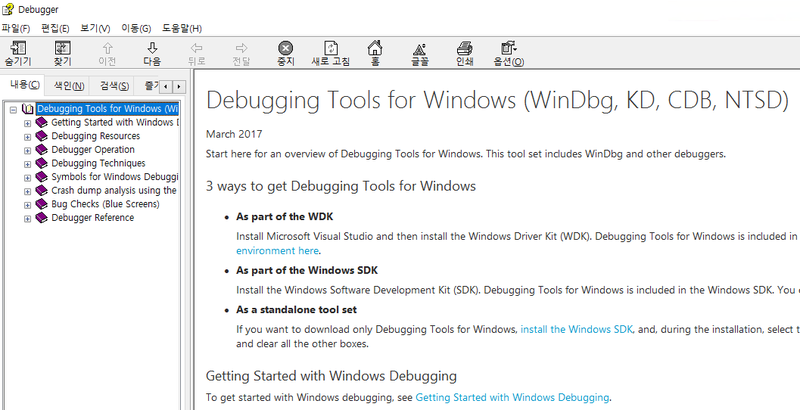 More of less like config for the debugger or debugger setting like commands 디버거 또는 명령과 같은 디버거 설정에 대한 설정과 비슷합니다. Start with . (read as dot) example .reload. Exported by debugger extensions or plug-ins which enhance the capability of debugger engine. 디버거 확장 기능 또는 디버거 엔진의 기능을 향상시키는 플러그인으로 내 보냅니다. You can create your own. 직접 만들 수 있습니다. Mastering all will be quite a job 모든 것을 마스터하는 것은 상당한 일이 될 것입니다. In most cases debugging is not about knowing all the commands but about knowing the internal data structures, functions and relations between them. 대부분의 경우 디버깅은 모든 명령을 파악하는 것이 아니라 내부 데이터 구조, 기능 및 이들 간의 관계를 파악하는 것입니다. .hh 를 실행하면 도움말 이 나옵니다. Did I miss !analyze-v ? 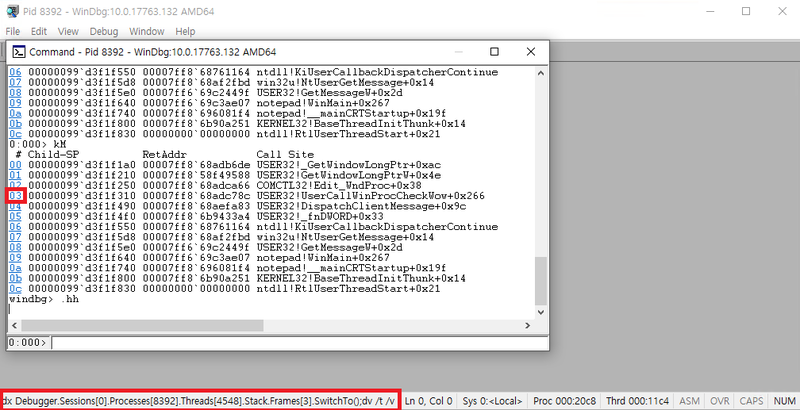 Mostly people uses windbg just for this command. But we are getting into something else. No dump analysis and !analyze-v for some time. 파란색 링크 형태에 마우스를 가져다 놓으면, 아래와 같이 어떠한 명령어 형태로 연결된 것을 확인할 수 있습니다.